Woori Bank Jobs Circular 2018. Recently Woori Bank Jobs Circular Bangladesh has been published By Bangladesh Online media and our website. We are found all information for Woori Bank jobs circular we also will be published Admit Download, post Result, and more information. So If you want to interest Woori Bank Jobs Circular 2018 you can apply for this job and join this Bank. Male and female are Bought can apply for this job. There are Senior Officer Finance post Trade can be published this circular. We also will be published woori bank job exam result, exam preparation, and more information this page. So if you want to interest this information can you download all this page. Woori Bank is the Best commercial Bank Now this time. As a Resul, They are increasing day by day their branch. So they announce some vacancy of the there bank. Recently they are published probationary Officer post job circular. As a result, you can join this jobs circular. Here we are found all information Woori Bank Jobs Circular Bangladesh 2018. Get more jobs circular visit our Home Jobscirclar page. Most important information are given bellow. Candidates must have 3 (three) years of work experience as a full-time employee in any reputed commercial bank in Bangladesh. Must have 2 years of continuous work experience in Trade Finance / Trade operation Section in any reputed commercial bank in Bangladesh. Candidates must have 3 to 5 years of work experience as a full-time employee in any reputed commercial bank in Bangladesh. Must have 3 years of continuous work experience in Trade Finance / Trade Service in any reputed commercial bank in Bangladesh. Candidate having third Division/Class or CGPA below 3.00 in his/her academic career, need not apply. Education Qualification: Applicants must have BBA/MBM in any discipline or Masters in Finance/ Banking/ Economics/Accounting/ Management/ Marketing/ Law from any Public or Private University. • Candidates must be Computer knowledge of Microsoft Office package. • Age should not over 30 years as on August 2, 2016. Interested Candidate having CGPA below 3.00 out of 4.00 in his/her Graduation and Post-Graduation, GPA below 4.00 out of 5.00 in S.S.C. and H.S.C. or below “B” grade in “0′ & “A’ level, need not to apply. interested Candidate may apply directly to The Head of Human Resources, Woori Bank, Country Office, Suvastu Imam Square (1st Floor), 65 Gulshan Avenue, Gulshan, Dhaka- 1212, Bangladesh. Woori bank Job exam result will be found here. After given exam, we will be found this job exam result. At first, Woori bank job exam result will be published there official website. As a result, the same time we are found this result here so you can download exam result here. Woori bank was established on September 21, 1996. Woori Bank (head office) in Korea. Dhaka branch is the branch of Woori Bank. Woori Bank is a largest commercial Bank in Bangladesh. 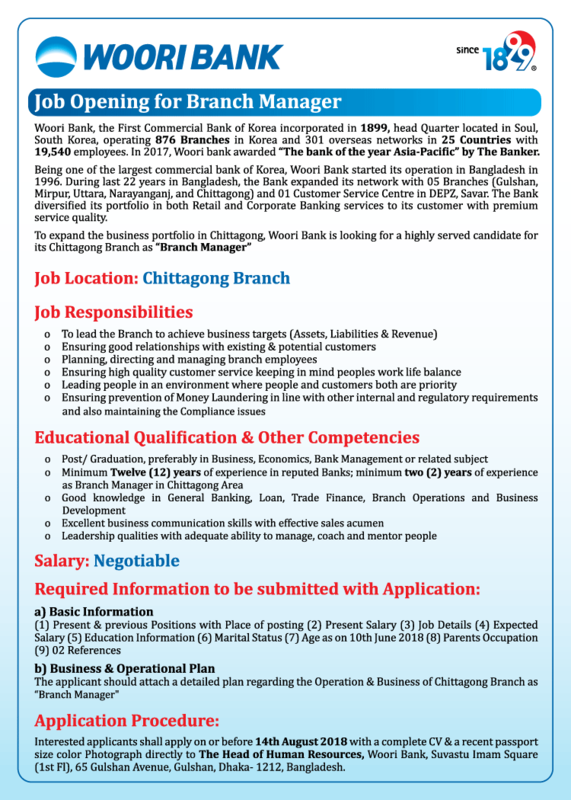 Woori Bank invites application from interested and qualified candidates..